Bojangles' latest new menu item is the Chicken Supremes Sandwich, which can be found for a limited time at participating restaurants. 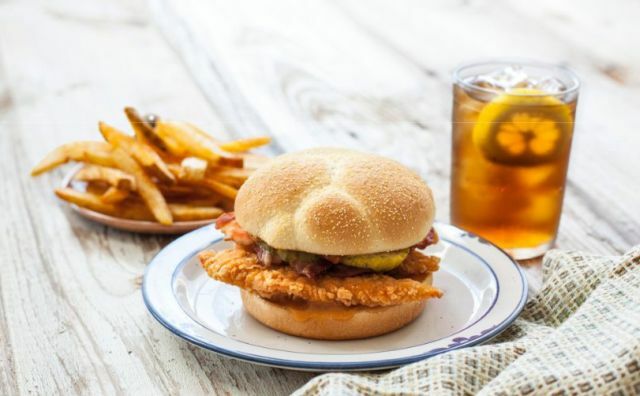 The sandwich consists of three Chicken Supremes tenderloin strips, Zesty Sweet Sauce (featuring brown sugar, cayenne hot sauce, and a touch of molasses), two strips of hardwood-smoked bacon, and four dill pickle chips on a buttered and toasted bun. Chicken Supremes are the spicier and older of Bojangles' chicken strip options. The milder Homestyle Tenders were introduced back in 2013.